This Crozes-Hermitage was made entirely from the Syrah grape and comes from very stony, red clay soils. 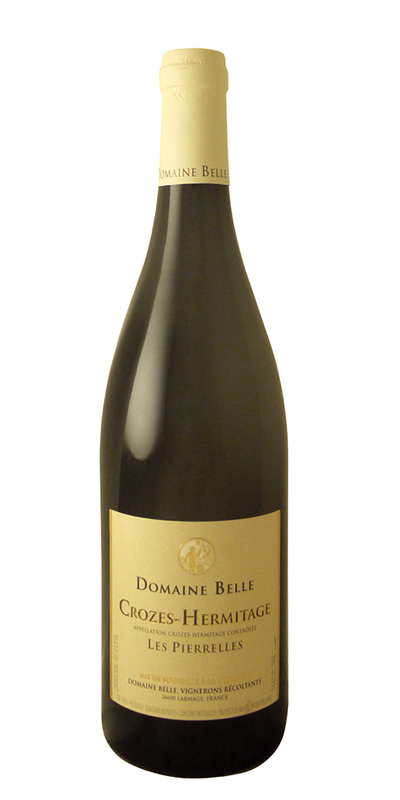 The palate is full of dark, peppery berries and is supple in texture. This comes from 80-year-old vines. This gorgeous, layered Syrah comes from old vines on stony soils. It is fermented with indigenous yeasts and aged in older barrels for 14 months, resulting in complex flavors and well integrated tannins. Notes of black plum and blackberry lead, followed by a potpourri of heady Northern Rhone scents: spicy black pepper, smoky bacon, dry earth, new leather, and green olive tapenade. On the palate, again powerful rich black fruits open, but pepper and earth and smoke come through in spades. Les Pierrelles would be equally at home with barbecued lamb belly, a char-grilled steak, or a smoked duck pizza. A deep and juicy wine to savor! Notify me when Crozes-Hermitages "Les Pierrelles", Dom. Belle - 2015 is back in stock.